Every few years California gets a great salmon season, and when that happens we eat a lot of salmon. On the boats I fish, I see lots of people getting their fish filleted and happily walking away with slabs o’salmon. They’re happy, but I can’t help but feel sorry for them: They just left the best part of the salmon with the mate: the salmon collar. I’ve been a mate before, although not on a salmon boat, and I know that what the clients leave behind is often the best part of the fish. In no case is this more stark than with salmon collars. What is a fish collar? It is the part of the fish behind the head and gills that extends to where you sliced off the fillet. It includes the pectoral fins. 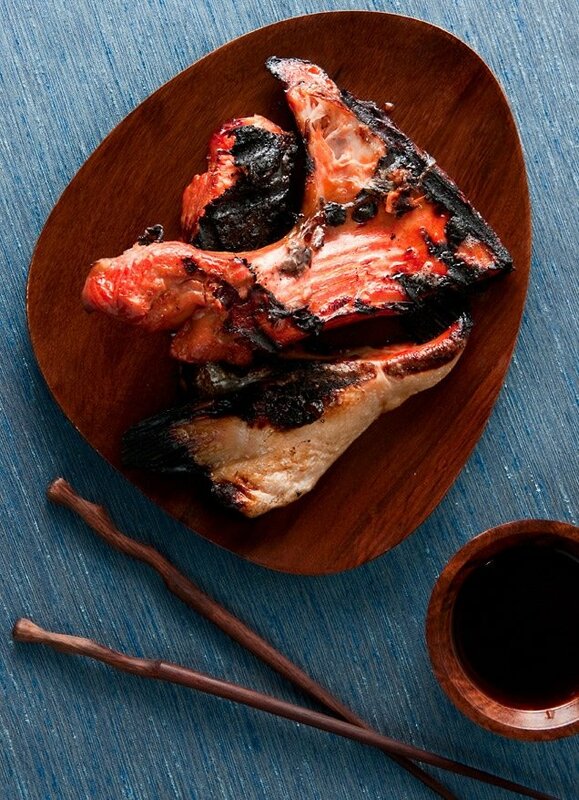 If you’ve ever eaten hamachi kama at a sushi restaurant, that’s the collar from a yellowtail jack. Why bother with it? Well, it is insanely rich, meaty and just plain fun to eat. Lots of rich, fatty meat nestles in pockets around the fins, and then you get some regular meat at the top of the collar that you missed with the fillet knife. In all honesty, I’d rather eat collars than the regular fillets. Only bother with collars from fish about 5 pounds or larger; anything smaller is not worth the trouble. You remove the collar after you’ve filleted the fish. Do this with a knife and/or a pair of kitchen shears. The best way is to fillet your salmon from right behind the head, taking the collar with you. Then, you slice off the collar from just behind the pectoral fin. 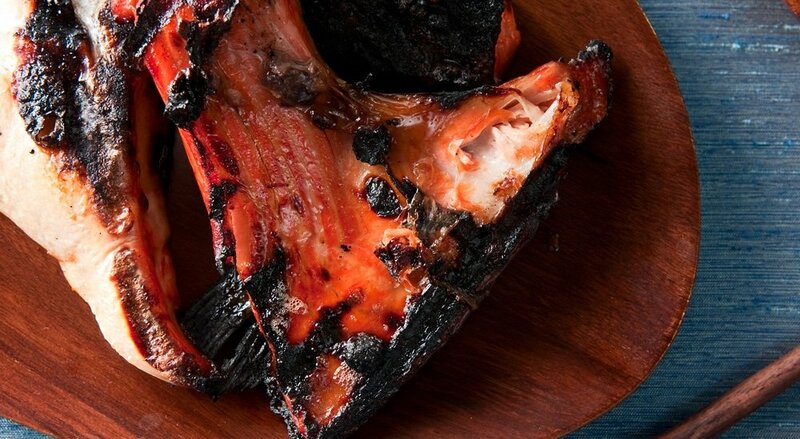 Salmon collars are made for grilling. I cook them in no other way, although you could broil them if you don’t have access to a grill. I’ve cooked them barbecue style, with indirect heat, as well as straight over the coals. I actually prefer a little char (oooh, fish pun!) that I get with the direct heating method. Indirect heat limits the charring, but the collars can stick to the grill more that way. Your choice. A marinade is a good idea. Why? Because the collar isn’t very thick, so a marinade can penetrate quickly, giving you a boost of flavor. What I provide below is a pretty traditional hamachi kama marinade, but let yourself run free. Your mind is your only limitation here. Dipping sauce? Traditional, but not vital. I’ve eaten collars both ways. 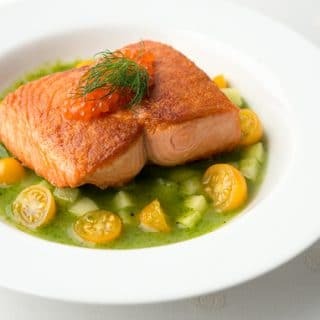 Ponzu, a citrus-soy blend, is a great idea for salmon, because it’s so rich. You might want a sauce with a little fat in it if you were to grill a collar from a lean fish, such as a lingcod or striped bass. 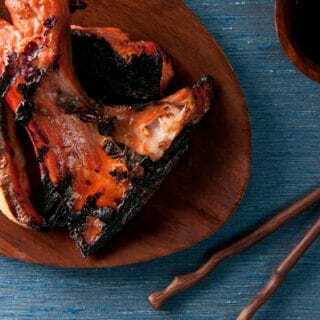 While I prefer to use salmon collars for this recipe, this dish is traditionally done with the collars from a yellowtail and is called hamachi kama in Japanese restaurants. Both fish are excellent here because they are fatty. Can you use the collars from another fish? Sure. I've done this with lingcod, striped bass and albacore tuna. Just use a large fish for this; something over 5 pounds. Put the sesame oil, soy and mirin in a container and toss with the salmon collars. Cover and marinate for at least 20 minutes, but 2 hours is better. You can marinate them as long as overnight, but more than that and the fish will get too salty. While the fish is marinating, mix all the ingredients for the ponzu sauce and set aside. Get your grill going. Wood is the best here, but charcoal or gas works fine, too. You want medium heat for fatty fish like salmon or yellowtail, hotter heat for a lean fish like a lingcod. The fat in the fish protects it from overcooking. Make sure your grill grates are hot, and spotlessly clean. Drain the fish collars from the marinade and allow to drip any excess away; this helps prevent flare-ups. Right before you set the fish on the grill, ball up a paper towel and grab it with tongs. Dip the paper towel in vegetable oil and wipe down the grill grates. Lay the fish on the grill skin side down. Cover the grill and cook until the skin side gets a little charred and a lot crispy. This should be at least 3 minutes, but if you have your heat at a nice medium, it will be closer to 5-6 minutes. Carefully flip the collars with a large metal spatula and cook for another 4-6 minutes on the meat side. Serve with steamed rice and the ponzu sauce on the side. The proportions of the citrus in the ponzu can be changed according to your taste, but please squeeze them fresh; it makes a big difference. Once made, the ponzu sauce will last several weeks in the fridge. You can find all sorts of recipes for salmon and trout here on Hunter Angler Gardener Cook! Hank, can you recommend a salmon fishing guide service for an ocean trip? Salmon Collars and Halibut Cheeks. People are missin the good stuff!